THE SUV is at the top of the vehicle-design fashion parade. Right now, there is nothing buyers want more than big truck-like vehicles. However, SUVs are not the only design out there. Compact to medium sedans still attract attention and Mzansi’s top three sellers are ready to be replaced in the next few months. 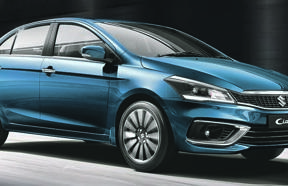 Expect the new versions of the VW Polo sedan, BMW 3 Series and Suzuki Ciaz soon. Volkswagen is quiet about when exactly it will add the new Polo sedan version to its top-selling Polo range this year, but SunWheels expects it to be introduced locally by around October. The new Polo sedan is bigger and more spacious than the existing model, which is vital as it needs to lure Jetta buyers, since VW isn’t replacing it with a new Jetta. The newcomer measures 4 480mm long – 90mm longer than the current model, with a wheelbase of 2 650mm – an increase of 97 mm – and a claimed luggage capacity of 521 litres – an increase of 67 litres. VW claims the Polo sedan will comfortably seat five adults. Its engine line-up, will consist of small-capacity turbopetrol units. The interior trim levels will match that of its sibling hatch. In March, BMW launches a new version of one of Mzansi’s favourite luxury sedans, the BMW 3 Series. The new 3 Series has grown in length by 85mm, while standing 16mm wider and is just 1mm taller than the outgoing model. It looks sportier than before – especially up front where it is dominated by a large kidney grille with a single surround, flanked by new shaped LED headlights. Versions include the Advantage, Sport Line, Luxury Line and M Sport. At launch only 320d and 330i versions will be available with more following later in the year. This promises to be another bumper year for Suzuki as it is ready to freshen up its line-up with an updated Vitara SUV, while a facelifted Ciaz is set to arrive here before the end of June as well. Design changes are significant and they include a redesigned grille and front bumper, fresh headlights with daytime running lights, LED foglights, LED tail lights and new alloy wheels designs. Suzuki is also upping the Ciaz’s interior trim with a redesigned dashboard and range-topping models will get a touchscreen-display multimedia system. Though the engine options for the South African market have not yet been confirmed, SunWheels is holding thumbs that the Ciaz will be available with Suzuki’s new 1,5-litre petrol engine. This high-tech engine promises excellent fuel efficiency.